Gibson F-10 Model Carved Top Mandolin (1934), made in Kalamazoo, Michigan, serial # 91445, black lacquer finish, maple body, spruce top, mahogany neck with rosewood fingerboard, original black hard shell case. One of the rarest Gibson instruments ever, and a particularly striking and distinctive mandolin. This F-10 dates to 1934, shortly after the model was introduced, and is one of the earlier examples of the very few ever built. The F-10, along with the similar F-7 and F-12, were intended as a line of master-grade instruments to complement the superlative but extremely expensive F-5 mandolin, which at $250.00 was out of reach of all but the most well-heeled players in the Depression era. Unfortunately, interest in the mandolin was quite low at that time, and while the similarly-positioned L-7, L-10, and L-12 guitars were relatively successful, the mandolins vanished nearly without a trace, with only the least expensive F-7 lasting more than a couple of years in the catalog. The F-10 features a lustrous black finish overall and elegant shaped pearl inlay on the fingerboard and headstock. Originally retailing at $150.00 (plus case), the mandolin was a full one hundred dollars less expensive than the F-5, but still priced above nearly all other extant mandolins. The design of this trio of instruments is odd to modern eyes, as they combine the f-hole body construction of the F-5 with the shorter neck of the oval-hole F-4. Despite this oddity, the F-10 sounds great with a distinctive guttural bark, if not quite the full projection and clarity of its longer-necked cousin. 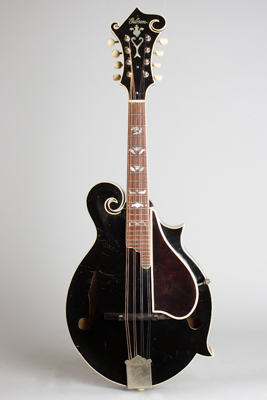 This is a fabulous mandolin for both player and collector, and an extremely uncommon find in a pre-war Gibson. All of Bill Monroe's earliest recordings were cut with a 1935 F-7, with a very similar sound and construction to this F-10. Overall length is 26 7/16 in. (67.1 cm. ), 10 in. (25.4 cm.) wide at lower bout, and 1 3/4 in. (4.4 cm.) in depth, measured at side of rim. Scale length is 14 in. (356 mm.). Width of nut is 1 1/8 in. (29 mm.). All original with only some minor pickwear to the top and some typical fretwear; certainly one of the finest examples in existence. Plays and sounds spectacularly well. Complete with original red-lined HSC, which is slightly over long to also fit an era F-5.